So you’re convinced. You’ve read “The Top Seven Mistakes Tea Drinkers Make“. You want to begin brewing looseleaf tea and develop your first real tea party menu. But where do you start? My article, “The Secret to the Simple and Quick Tea Party” talks about the first ten items I recommend purchasing in order to have what you need for a simple tea party for four. This article will give you the list of my favorite tea party food items to have on hand. 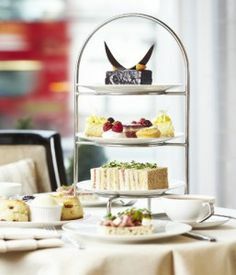 For more specific information on planning a full tea menu, click on my “Tea Party Food” category link on my sidebar. These items are great for the impromptu party menu or those who prefer minimal food preparation on a limited food budget. Boxed red pepper soup–easily garnished with a dollop of creme fraiche, some chopped candied nuts, and sprinkled chives. Candied nuts–to garnish a soup, salad, or both. Cream cheese and bread–the staple of tea sandwiches. Add thinly-sliced cucumbers, chopped herbs, sun-dried tomatoes, apple butter, or whatever you have available. Cut off the crusts and into triangles or rectangles and garnish if possible for quick and simple tea sandwiches. Frozen scones–My favorite local brand are Fat Cat Scones. Research what might be available in your area. Many scones mixes are available, like Cupboard of Blessings, as well. The best way is to prepare from scratch and cut scones at your leisure, freeze them, and then pop them straight into the oven when needed. Creme Fraiche and Lemon Curd—Trader Joe’s provides both. These are my favorite and quick accompaniments for scones. Chocolate Truffles –-if you don’t bake and 90% of women I know want something with chocolate. I’ve seen boxes of simple chocolate truffles at Trader Joe’s and Costco. Place them in paper candy cups (I collect them throughout the year based on the season) or on tiny paper doilies. Canned berry or cherry pie filling — My preference for garnishing pound cake quickly. If you have creme fraiche left over, whipped cream or vanilla ice cram, add them as well. Tea — Remember, this is The Tea Party’s Most Important Ingredient! Learn to brew tea the old-fashioned way and wow yourself and your guests. These aren’t your only options, of course. Enjoy browsing your local or online gourmet grocery store for more ideas of quick and simple tea party food ideas. Remember, food is only as good as the ingredients you put into it and less is more. 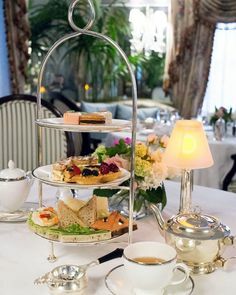 Tea parties are the time to provide a few bites that taste fabulous instead of stuffing your guests with food that is just different forms of white sugar and flour. Enjoy imagining your tea party pantry and what you want to have easily available for a little-touch-of-something for yourself or others. Whether it’s the first time you try party food planning or the 10th time you try to plan a party menu, you’ll quickly discover that food planning combines a bit of science, math, and art… all three neatly on one platter.